Today we took off to South Carolina. We drove across the Talmadge Bridge and headed through the beautiful, low country back-roads to Hilton Head Island. We arrived on the island just as the morning mist was burning off the marshes and we headed straight to the beach. Hilton Head is posh. The public amenities at the beach were beautiful and the beach itself was clean and soft and amazing. We relaxed on the beach and read books for a couple hours. Soaking up the sun is exhausting work and after a while, we were famished. We shook off the sand, packed up and drove to the other side of the island to have lunch on the fish dock at Hudson’s. We shared BBQ shrimp taco salad, she-crab soup and oysters Rockefeller. For dessert we set off to a private side of the island to find the highly recommended Salty Dog Ice Cream Shop. It was worth paying the nominal fee to drive into the gated community. We took off through the woods at the back of one of the ponds. At first we seemed to be on a trail that others had taken before, but we soon lost that trail and we were proper lost and neither of us had brought our cell phones on this “short” walk. Using the quickly setting sun, we identified the direction we thought we should be heading we kept walking. It was serene and quite beautiful until suddenly a loud rustle scared the crap out of us. 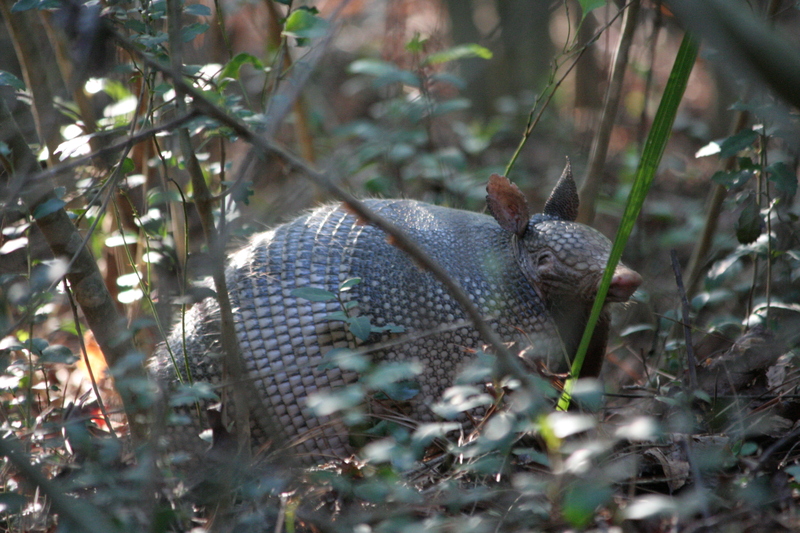 Out of a mound of leaves at our feet emerged a beautiful armadillo. We thought that was a pretty cool nature sighting until we realized we were still lost. We thought about trying to turn around and find our way back but decided we were too far in and need to trudge ahead. After another 15 mins. we finally ran into the main trail that we were looking for. Very relieved, we marched out onto the trail. 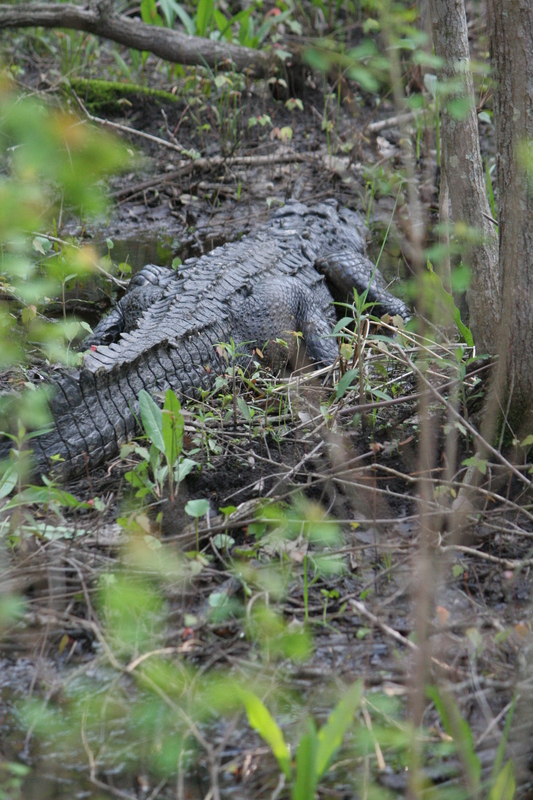 I turned to look back at where we had come out and just 20 feet away was a huge alligator!!! Mom and I swallowed hard and made a brisk walk back to the car. We drove back to Savannah to enjoy a bottle of wine and the hot tub.